Get on board this Whale Watching Cruise from Mooloolaba for close encounters with magnificent Hump Back Whales as they migrate up and down the east coast of Australia. 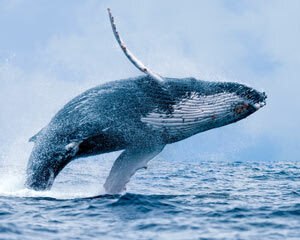 Prepare to be amazed and humbled as you witness these magnificent whales up close and in their natural environment. Naturally curious creatures the whales will often approach the boat and put on a show breaching, splashing their massive tail flukes and spyhopping (raising their heads out of the water for a look around). As well as Humpback Whales there are also regular sightings of Minke Whales, dolphins, turtles and many varieties of sea bird. Cruises operate daily from June to November and last approximately 3 hours. Book now before they're gone for another year! Awesome staff on board. Although not many Whales were around that's the luck of the draw. Have given your web to friends heading over soon. The 2 young men who were in charge of our experience made it for us they were very knowledgeable & witty which was fantastic 2&1/2 hours of absolute pleasure. Whale one was a great experience. The experience was very good in all respects and met our expectations fully. I thought the boat fit out was awkward, seating needed to be configured better! Had a great day, and I thought the crew were very passionate about their job, which was great! So glad I went, never bothered before Skipper was interested and as excited as we all were when we got a spectacular display of many whales breaching and tail slapping!! Wild animals as he said so you never know if you'll see any but wow they found the pod and the display was awesome! !